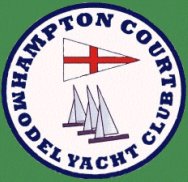 Hampton Court rounded off the RA class season on Sunday 18th October with it's annual "St. George Trophy" event. Eleven skippers took part in the event on a cold but occasionally sunny day with fluctuating wind conditions. By lunchtime, 3 skippers, Dave Andrews, Vernon Appleton and Mike Stroud had established themselves as the ones to watch. Peter Townsend had the bad luck to suffer winch problems and missed 6 races - fortunately he was able to effect repairs and resume racing in the afternoon. After lunch, Colin Trower began to challenge the earlier leaders but by the end of the day, after 17 races, Dave Andrews was the clear winner with 29 points. Only 1 point separated the next 3 places - Vernon Appleton was second with 41 points on count-back from Mike Stroud also on 41 points. Only one point behind on 42 points came Colin Trower to take 4th place. My thanks go to my Race Team of Julia Hancock, Graham Gurney, Peter Smith and Ron Perkins for their hard work in making this a very successful day's racing.